Over the years, the Genesee Ecosystem Management Committee (GEM) has informed homeowners of the dangers of Dwarf Mistletoe. An extensive identification and culling campaign in the open space areas has been successful. However, infection rates continue to rise on private property and isolated infestations continue to be identified on Open Space. If we act jointly now we can save many trees. It is unlikely that any residents of Genesee would welcome the wholesale loss of our beautiful ponderosas here in Genesee, yet the lack of preventative measures and removal on private land will inevitably lead to a greater number of trees being lost. Dwarf mistletoe is a common stress factor that invites secondary infestations like mountain pine beetle. 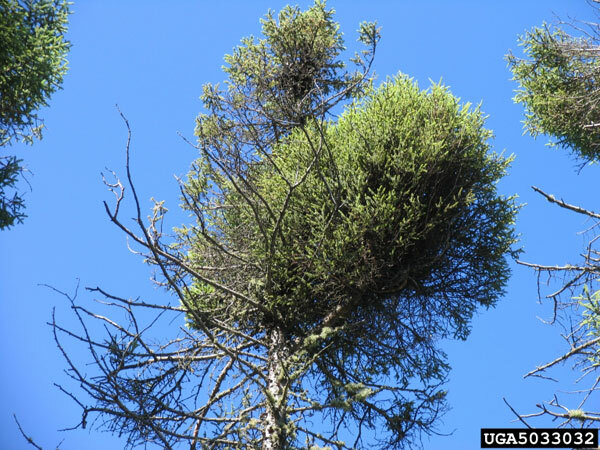 Along Lake Dillon roads, surveys showed a dwarf mistletoe increase of 13% from 1958–1999. Some plots indicated as much as a 70% increase over the same time period. When combined with comandra blister rust, nearly 85% percent of the lodgepole pine trees in the Lake Dillon survey had a pre-existing stress factor. Some of the identified lodgepole stands in the area will have to be completely replaced in order to improve the overall forest health. If you take a quick drive around Lake Dillon today, you can see what effects a mountain pine beetle epidemic has had on this forest. Mountain pine beetle will attack stressed trees, and if the numbers are sufficient, they will successfully infest healthy trees. The Dillon area expects to lose over 50-60% of their trees over the next 7–10 years. Help your trees stay healthy so they can ward off mountain pine beetle attacks. Two infected trees within 60 feet of each other will infect 80% of trees in between. Can also be spread by birds. This extra stress on trees leaves them more vulnerable to bark beetle and other insect infestations. All ponderosa pine trees are at risk, even our biggest and prettiest trees. Spraying only temporarily slows but does not stop the infestation. Dwarf Mistletoe (Arceuthobium spp) are host specific parasitic plants that infect ponderosa pine trees in Genesee. This parasite is a native plant to the region. It has evolved and developed characteristics allowing it to survive and propagate for thousands of years. Dwarf mistletoe is most abundant in the upper ponderosa pine elevations of 7,700–7,872 feet. It is generally found on ridge tops, intermediate on mid slopes and least commonly found in stream corridors and canyons. This distribution will vary greatly. There are many examples of dwarf mistletoe infected trees in stream corridors and canyons in Genesee. Visible on the branches and stems of trees supporting the parasite, as seen on the front cover of the Genescene, dwarf mistletoe has a distinct yellowish-green, olive color. It is a small, leafless, perennial plant that produces seeds from late July to early August. The sticky seeds are expelled through a buildup of water pressure in the plant and can travel a distance of forty to sixty feet. ' Because of wind or obstacles in the flight path, seeds produced typically will travel 15 feet from the original plant. Seed discharge is responsible for most new infection sites. Birds and squirrels may be responsible for transporting seeds to locations outside an infection area by sticking to the feet and feathers of these animals. After seeds have been expelled, research has shown approximately 10% of them will adhere to the tree surface (branch, stem or needles). From that 10%, nine out of ten will stick to the needles of the tree while the remaining seeds adhere to branches and the trunk. Seeds that originally adhere to needles will slide down the needle to the branch bark when it rains. Once a mistletoe seed is attached to a potential infection site, it germinates and roots into the nutrient system of the host tree. Dwarf mistletoe depends on the host tree for most of its water and nutrients. If the host tree dies, so will the parasite. In ponderosa pine trees, dwarf mistletoe infects a tree with bark less than nine years old. When ponderosa pine bark matures it becomes very thick, preventing the parasite from penetrating into the tree. Unfortunately, cracks and fissures where the bark is thinner on older ponderosa pine trees are considered likely sites of new infection. Once dwarf mistletoe has successfully germinated into the host tree, it incubates two to eight years before the plant's flowering stems are visible. Dwarf mistletoe affects nutrient and water flow in a tree. The parasite uses the tree's nutrients which causes a steady decline in branch and needle growth. Once foliage in the tree is not able to provide the minimum photosynthetic activity to maintain the tree, the host tree will die. During periods of drought, the mortality of a tree can be four times greater in a tree infected with dwarf mistletoe than a non-infected tree. This is evident in larger infested areas as seen along Currant Drive where many trees have succumbed to this parasite over the last five years. The table below shows how the infection severity and size of a tree is related to a ponderosa pine tree's mortality. Swelling in the bark is the first sign of dwarf mistletoe in a tree. Initially this is very difficult to see, but over time the parasite will cause the tree branch to distort and create a "witch’s broom". This will take many years, but witches' brooms are very easy to see when developed . It is difficult to identify trees lightly infected with dwarf mistletoe. The parasite plant may be concealed by needles and branches and the tree may not show outward signs of stress. Conversely, a heavily infected tree does not grow vigorously; the needles are short; have a yellow color and you will see branches die off. When a tree is close to death, the top becomes completely void of needles. If the tree continues to survive, the rest of the tree will exhibit the same characteristics. Research has shown that wildfires are the most important single factor governing distribution and abundance of dwarf mistletoe. Trees not infected with dwarf mistletoe will return to burned sites quicker than parasitized sites. However, fire may ultimately increase dwarf mistletoe abundance and distribution because spotty fires leave scattered, live, infected trees that re-infect the new post fire stand of trees. Over time dwarf mistletoe will kill a tree. It takes many years, but during this time the parasitic plant will re-infect the same tree and eventually spread to adjacent ponderosa pine trees. This spread will continue at a rate of one to two feet per year. If the canopy is open and there are less trees to block seed dispersal, the spread rate will be greater than two feet per year. Trees infected with this parasite attract secondary infestations such as mountain pine beetle. Dwarf mistletoe inhibits a trees growth, weakening the tree and preventing it from repelling mountain pine beetle attacks. Over the past five years, every tree in Genesee infested with mountain pine beetle has had a pre-existing stress factor, dwarf mistletoe being the most common. Pruning and removing trees infected with dwarf mistletoe is the best management available for trees located in the landscape. In larger tracts of land, this may not be feasible due to access challenges. Trees heavily infected (more than 50% of the branches with mistletoe) should be removed. Trees with this level of infection are the primary seed source within an infester area. They will shower seeds to smaller sapling trees below as well as to adjacent trees of similar size. Trees only lightly infected can be pruned to remove dwarf mistletoe. Once the branch is cut, the mistletoe on that branch will die. Landscape barriers can be used to prevent dwarf mistletoe infected trees from reaching areas without infected trees. Examples include rock outcroppings, non-host trees, clearings and man made barriers, i.e. houses and buildings. Areas known to have dwarf mistletoe must be examined every two or three years. If any branches are infected, they should be removed before the parasite produces seed in July. Chemically treat infected trees to kill mistletoe stems. This must be repeated every two to three years by a licensed applicator. If dwarf mistletoe is present, plant non-host specific trees such as Douglas fir, aspen and blue spruce. With the exception of using chemicals, Genesee actively manages mistletoe on Open Space similar to how it is managed on private property. A survey is conducted annually to review known mistletoe infester areas. These areas are monitored for spread and prioritized for management which includes tree pruning and removal. While hiking trails in Genesee, residents have observed dwarf mistletoe and reported their findings to the Genesee Foundation Open Space office. This information is extremely valuable in identifying new locations and to evaluate previous management areas. If you see dwarf mistletoe on Open Space, please contact the Foundation Open Space office (x9463) to report your findings. Chemical treatment - Ethephon sprays are widely used in Genesee and surrounding communities. It is usually recommended for landscape trees that maintain a high value. The chemical doesn't kill dwarf mistletoe; it only kills the flowering portion of the plant which effectively reduces seed production. This control measure must to be repeated every two to three years for the life of the tree.